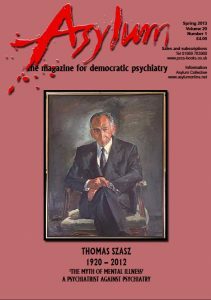 Dr Thomas Stephen Szasz 15 April 1920 (Budapest) – 8 September 2012 (Manlius, NY); With the death of Thomas Szasz, at the age of 92, psychiatry has lost its most vociferous critic. Asylum 19:4 began with an appreciation by Ron Roberts. Having called for contributions, we now mark the event with a collection of different perspectives on Szasz’s work and ideas. Of course, Szasz was critical of one of the historical roots of this magazine. In 2010, when asked to comment in support of the magazine’s relaunch, he said: I regret that I cannot support the idea of a ‘democratic psychiatry’. For me, the issue is coercion versus non-coercion. (Democratic Psychiatry is a term associated with Basaglia’s Italian version of locking up mental patients. See my book, Antipsychiatry: Quackery Squared.) Good luck with your… relaunching of Asylum. Since this magazine is meant as a forum for debate, we decided to include not only pieces broadly in support but also those more nuanced or critical of Szasz. Alec Jenner and Morton Schatzman are closest to being Szasz’s contemporaries. Jeffrey Schaler runs www.szasz. com. Richard Vatz and Irish survivor Mary Maddock both offer warm tributes, whilst Joanna Moncrieff summarises Szasz’s contribution to debates about psychiatry. People are often unaware that Szasz did not oppose consensual psychotherapy. His views on this and other issues are discussed by Anthony Stadlen, who was his London host when Szasz conducted a one-day seminar in the UK in 2010. Szasz was a prolific writer, and Phil Barker and Poppy Buchanan-Barker review three of his last books. Ron Roberts writes about Szasz’s views on responsibility, morality and politics, while Dave Harper reviews his legacy. Although many psychiatrists may dismiss the psychiatric survivor movement as simply an offshoot of ‘anti-psychiatry’, the reality is more complex. For example, in 1978, in her seminal book On Our Own: Patient-Controlled Alternatives to the Mental Health System, American self-identified ‘expatient’ Judi Chamberlin (who sadly died in 2010: see Asylum 17:3) noted the relevance of Szasz’s critique. However, by 1990, in an article in the Journal of Mind and Behavior, she observed: ‘Anti-psychiatry’ is largely an intellectual exercise of academics and dissident mental health professionals. There has been little attempt within anti-psychiatry to reach out to struggling expatients or to include their perspective. The articles in this issue by survivors Peter Lehmann and Anne Plumb reflect this more nuanced approach to Szasz’s work and ideas. Pat Bracken, Phil Thomas, David Pilgrim and Anthony Morgan also take issue with some of Szasz’s assumptions. As we prepared this issue, the Inquiry into the ‘Schizophrenia’ Label published its interim report. Since Thomas Szasz was such a critic of the notion of schizophrenia, it seemed fitting to include it. Given the debate about Szasz’s relationship with Scientology, overleaf is a letter by him on this topic (courtesy of Peter Lehmann). … BUT UNSYMPATHETIC TO THE REALITIES OF PERSONAL CRISIS? Help Depression With A CBT Self-Help Book? ‘Schizophrenia’ – Time To Discard The Diagnosis? To read the latest issue, SUBSCRIBE to Asylum magazine.